RODEO: The region's reigning cowboys and cowgirls will saddle up for two nights of rodeo fun this weekend at Rockhampton's Great Western Hotel. After a successful run in Aberline, Texas from August 1-4, a number of Central Queensland riders will be making an appearance in the young guns. 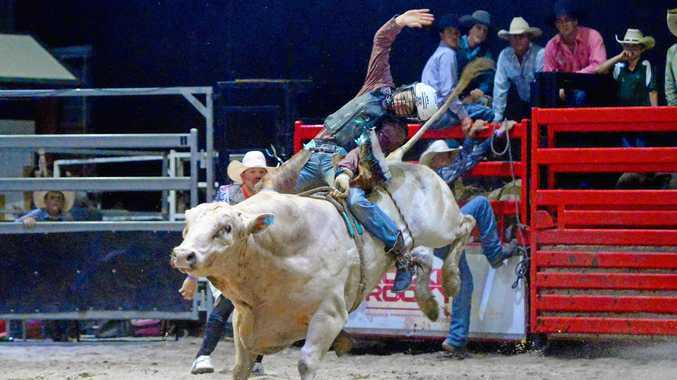 At the Youth Bull Riding World Finals, Macaulie Leather received first, Ky Hamilton placed second, Brady Fielder came third, Elijah Leather came seventh, Aaron Klieir came 10th and Josh Cavanagh placed 14th. Klieir was also named as the PBR Rookie Champion last year and is currently "number one in the country at the moment". Chelsea Bowden, 17, will be competing in eighth rounds of both the Young Guns and the opens Top Guns rodeo on Saturday night. "This weekend is more of a lead up to get points before the final round," Bowden said. "The next two rounds will be pretty tough competition to get points for the buckle. "There's a pretty strong competition going around with Payton Simpson and Jemma Slotoch who are both strong competitors." The final will be held November 1-2. Bowden began riding four-and-a-half years ago after being introduced to the sport on her parent's property. "It's just the fun of doing it, not really the competition for me," she said. "I just love getting on my horse and riding. "You need to right head space to smash it out. Like Macaulie, who can get on 15 bulls a day. "There's a mental side to it. You need to focus on just you and the bull." A stand-out for the night is expected to also be world champion Macaulie Leather.